VestaCP provides an excellent “menu” for choosing what one wants to include in VestaCP in ONE installation command. All one needs to do is navigate to its main page and you will find a menu with some default settings as well as options for the settings with which to output ONE Installation Command. I wanted the lightest possible VestaCP for a beginner VPS. I was planning to use the VPS as a single user, i.e. 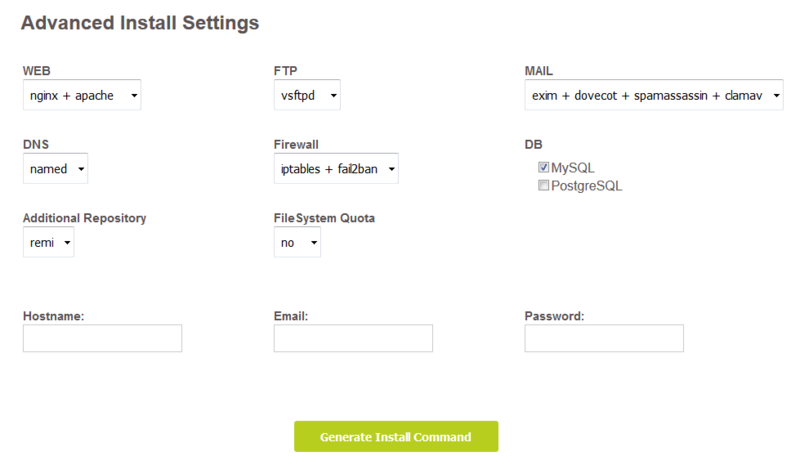 not allocate hosting accounts, so then elected not to install an FTP server. VestaCP of course doesn’t come with a free File Manager, however I’m quite happy with FileZilla and decided to go with SFTP instead of FTP. I also decided not to install a mail server as it is easy if not used expertly for it to be vulnerable for exploits. If mail is needed with my domain later on, I was planning to use a free e-mail host like Zoho or Yandex. Yandex in particular is very generous with the number of e-mail accounts that are allowed for use with one’s domain. Initially I thought to go for no DNS either, but soon found that to be a problem, so did a second install where I selected “named” for installation of a Bind Server. I assumed that if I selected Remi for the Repository that that would make it easier to update VestaCP. For the hostname I had to think what it should be, and then thought to go with vps.domain.tld, but in hindsight should only have gone with domain.tld. It was easy to remedy though, as soon as my Panel was up, I created a new domain with domain.tld, and deleted the vps.domain.tld. I don’t know much about fail2ban, but thought it could only be good to have, so still have to study how it works.